Summary of Glut9 sites of expression and function. Glut9 plays an important role in the control of urate homeostasis by its role in several organs. In kidney, evidence strongly supports a major role of Glut9 in uric acid reabsorption; in intestine, Glut9 may participate in uric acid excretion, although there has been no direct testing of this hypothesis; in the liver of animals with active uricase, Glut9 is required for hepatic uric acid uptake and conversion to allantoin for excretion. 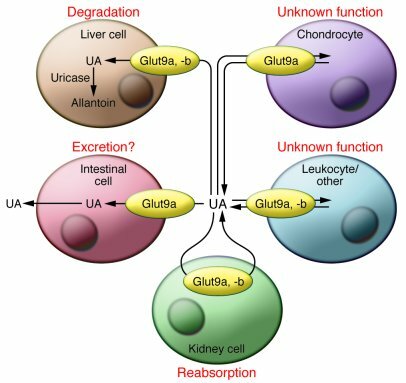 Absence of uricase in humans raises the question of the role of hepatic Glut9 in humans. There is good evidence for Glut9 expression in chondrocytes and leukocytes, but so far there is no indication whether this transporter is required for uptake or secretion.